Imagine yourself being an electro-mechanical engineer back in the late 1940s. This was a period of vacuum tube electronics, and the appliances using this technology were widely used from the household to the heavy industry. it was a time where the technology was mastered. This vacuum tube “castle”, a safe and predictable technology, had gone through many cycles of improvement since its inception at the turn of the century. On the other hand, it was clear that the technology was reaching its limits in many applications that required different characteristics of portability and power consumption. The ”sandbox” experiment that would revolutionize the whole field of electronics had been carried out in Bell Laboratories and was unveiled in 1948 – the transistor. We know what happened next. Of course, with the benefit of hindsight, it is clear that the transistor would wipe away the old technology. But I’m sure that it was not so obvious to electro- mechanical engineers a few short years before 1948. Is the traditional consumer financial system, based on bank accounts, in the same situation today? Are we in the age of “vacuum tube financial services”, with the transistor right beyond the next hill? I can see solid, substantiated indicators that make me think we are indeed facing such change. I’ve observed these indicators over the last year, and they appeared even more clearly to me in the new job I took in the Financial Services for the Poor and the Bill & Melinda Gates Foundation. The first change comes from the next generation of consumers. The Internet is now more than 20 years old, which means that anyone under 40 has never known a social or working life without it. As a result, younger consumers come to the market with different expectations from service providers. Instead of technology being used to hold them captive, they expect service providers to use technology to empower them to determine not only how services will be provided, but what services will be provided. Just consider how today people prefer to use their Facebook name to identify themselves to new sites on the Internet, showing how the power gradually moves into their hands. 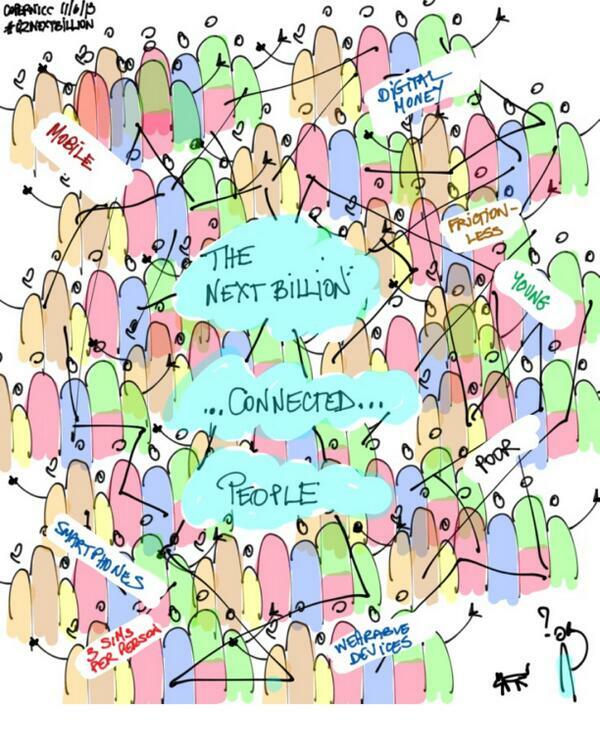 The next billion connected people. They will have a voice they don’t have now. banks. The problem the banks have in serving these people is not so much in terms of lack of revenues, but it is mostly of having access to them, as many of the poor people are far away in rural areas without traditional banking coverage (branches and ATMs). The other problem is getting to know them, as the traditional ways of identifying people (social security, street addresses, etc.) are mostly not available to these people. On the other hand, a large majority of them have a mobile phone, a very powerful instrument of communication but also inclusion. This explains why the telecommunication companies are increasingly seen as instrumental in making financial services available to the unbanked. The last change comes in the way we access and consume financial services. Perhaps this change is most perceptible with the advent of the tablets. As an European consumer until recently, I was used in dealing with my few banks through heavily secured web sites – all different, all using specific and incompatible hardware security tokens. The smart phones and especially tablets have simplified this considerably, but most of us are still facing a different app for each service provider, while what we really want is to have a seamless and integrated view of our financial assets. One identity, one user interface for all service providers. The above changes – really new, fundamental requirements – are driving the pace of technological innovation. I’ve observed four of these innovations, and I will illustrate them mentioning companies that have products available today or in a matter of months (I’m mentioning these particular companies because I had the opportunity to study them firsthand. I’m not related in any way with any of the mentioned companies). The first innovation is bitcoin. I think of “bitcoin” (lower case) as a technology, as opposed to “Bitcoin” (upper case) the crypto-currency. Bitcoin, the currency, has been through several boom and bust cycles, served (or not so well served) by the Bitcoin exchanges, some of which have recently succumbed to concerted hacking attacks. It is possible that the new wave of exchanges, should they be better equipped for operational excellence and “five-nines” availability, will propel Bitcoin as a widely used currency. In my mind though, the true innovation is not about the currency but is about the bitcoin blockchain, a single database massively distributed and replicated, without any central coordinating point. Ripple, a company based in San Francisco, uses this idea to propose what they describe as a low cost, worldwide, multi-currency payment mechanism they say is faster, more secure and simpler to use than any banking based alternative. The system is based on secure wallets managed by the users themselves, and a distributed ledger inspired by the bitcoin blockchain. From the customer perspective, the operative word is low cost – the system is open, and as there is no central authority necessary, there are therefore no fees associated to intermediaries. The second innovation is the business API (application programming interface). The API has been used since many years by software developers to assemble program components within an application. The new use of APIs is to make business functions available as components on the Internet (think how Google Maps can be integrated into other applications and web sites). The promise of APIs is to grow volumes from existing customers, and attract new customers without friction. Adopting APIs does require though a leap of faith in the traditional marketing doctrine – indeed, rather than trying to “capture” customers into a bespoke system, the API actually fosters opening the systems to be freely assembled by the consumers in the way they desire. As such, making the move to business APIs is a tricky decision to make for many businesses, especially the banks. Stripe, a company based in San Francisco, proposes to enable a business to process electronic payments simply by integrating Stripe’s APIs (and supporting processes). Apigee, another company in the Silicon Valley, propose to “API-ise” a business and make their services available in new ways on the Internet. So does the Open Bank Project, a German startup, who focuses specifically on banks. The third innovation is a crowd-sourced, social media based, identity system. In the current financial system, regulation impose that banks and other players conduct “Know Your Customer” (KYC) activities, with the goal of confirming the identity of people that open accounts and conduct transactions. In many occasions though, KYC proves to be very cumbersome because it implies manual checks of various documents. I can vouch, as a newcomer in the USA, that opening an account can be very tricky if you don’t have a document proving that you live at a particular address (but living at a particular address does require usually to have a bank account, as you need to pay rent or mortgage – you can see how tricky this can be). Viewed from the perspective of onboarding billions of people, it is clear that a different solution is needed. OIX (the open identity exchange) and the Respect Network have come up with a crowd-sourced reputation system on the internet, where people on the internet can trust each other based on their digital reputation. I’ve written previously about how this works in some detail. I’ll use another example to illustrate – think about your persona on Facebook. Your timeline, friends, likes describe a digital identity that can be trusted over time, as more and more interactions accumulate. In other words, another way to look at Facebook (or LinkedIn and other major social networks) is as a trusted identity system. Now, Facebook connects in excess of one billion people, many of them unbanked, which could be a great opportunity to hook these people to financial services without friction. For example, Fidor, a financial service provider in Germany, allows you to open an account with only your Facebook profile. Of course, they will only let you start with a reduced service, and will provide additional financial services as they know more about you. This “tiered KYC” system reduces friction and is a powerful instrument of inclusion. The fourth innovation is about using the open source movement in the context of financial services. Mozilla is a good example of how it is possible to create a community of millions of developers working on the same project, based on meritocracy. Outside of the well known Android and Firefox projects, Mozilla has recently shown that open source can be applied to hardware and not only software – the $25 Mozilla smart phone promises to be another instrument of inclusion to the internet, and also of course financial services in the long run. 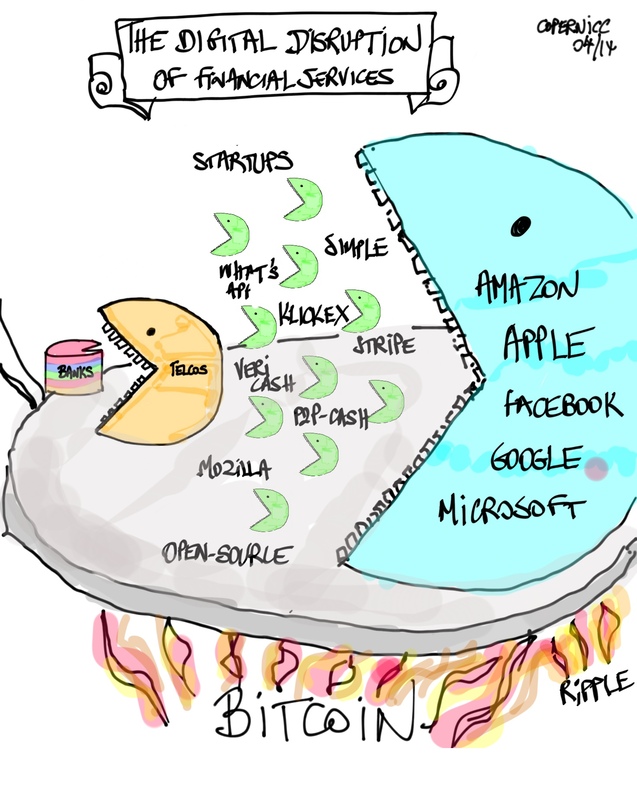 I’ve written about how the open source concept is being applying to core financial systems. Allevo, a Romanian software company, has recently put in the open source domain a core banking transaction-processing software. OpenGamma is a UK startup that uses open source to provide a risk analytics platform, one of the “crown jewels” of banking, to financial institutions. How can we then envision a financial system that rides the wave of change, and leverages the technological innovations we have reviewed above? Be accessible safely and reliably from connected devices, from feature phones to smart phones to other specialized (wearable?) devices. Be based on open APIs so new service providers (payments, insurances, loans, etc.) can be connected and discovered easily. In addition, the platform should be available in open source – so that it can be permanently refined and built upon, as a common asset of the humanity. Deploying such a platform and fostering its deployment in countries and – why not – globally: that is the ambition of the Financial Services for the Poor initiative of the Bill & Melinda Gates Foundation. In this endeavor, the technology I describe will be necessary, but not sufficient. As I have written previously, another important aspect of the work will be to put all the key stakeholders around the table – banks, central banks, telcos, startups. All hands will be needed on deck to deploy the technology to work openly, safely and reliably. I’m lucky to have a job where I have the opportunity to meet a lot of innovators in financial services and fin-tech. As a consequence I build up a sense of the state of the industry and the key trends ahead, and I love to share these insights on this blog. Of course, I had the finger on the pulse of the fin-tech startup community in my Innotribe job in the last 4 years. Now, working for the Bill & Melinda Gates Foundation, I focus on building financial payment platforms for the poor people and thus meet a wide range of stakeholders – governments, banks and central banks, telcos, mobile money operators, technology giants and startups. I can tell it makes for a very wide perspective and I do spend considerable time thinking and integrating this rich input. I love doodling as well, so when inspiration comes I take my iPad and my faithful Jot pen and I try to capture this in a drawing. Here’s the latest one – a cartoon depicting in a funny way what I think is the state of the consumer financial services industry. I’ve posted it on Twitter and it generated an incredible amount of interest, so I thought I’d share some more about the underlying thinking, and also some additional insights coming from the numerous comments on Twitter. Well, optimist that I am, I really thought of my drawing as a cartoon, exaggerating a situation to make a point. Philip rightly points out that sometimes real life is itself an exaggeration! Indeed, I don’t think someone will acquire a global bank with 2 trillion US dollars in its balance sheet. But the point is not about acquisition, it is about who will eat these bank’s lunch if they don’t pay attention. Telcos are tempted to provide financial accounts, even though it makes them getting into the murky (for them) waters of financial regulation. In fact, in my focus countries (Nigeria, Indonesia, India, Pakistan and Bangladesh), telcos are probably best placed to reach out to poor people in remote, rural areas. By delivering financial accounts and person-to-person payments, telcos and other mobile money operators are developing the next generation of low cost payments platforms. 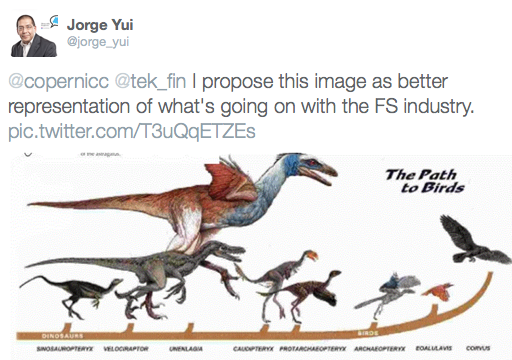 My belief is that these new platform will simply prevail in the traditional financial system (often referred to as “the rails”) – why in the world would we continue to use more complex and costly variants? In other words, if banks don’t embrace these new recipes for lower cost rails, they will be in dire straits. The readers of my book (“The Castle And The Sandbox”) will recognise this argument – banks will need to step out of their established “castles” and innovate and experiment in “sandboxes” to understand and adopt these new platforms. The bounty, the vision, is the volume that will be brought in the system by the 2,5 Billion people who are currently out of any financial system. There is a show on French TV (“On n’est pas couché”) that used to start by introducing who is NOT invited to the show. Similarly, I’ve had a number of comments about who is not shown in the cartoon, and notably Paypal, Visa and MasterCard. More seriously, I do think Paypal, the card companies, and indeed many banks do have innovative products and services “on the rails”. If you are following my blog you know that I’m a big fan of Paypal for international payments. Now, on to the “hot” topic! I hope Philippe will comment on this post and explain more. I love the way Tomasz has captured my meaning – “Bitcoin slowly but surely heats up the pan”. I’ve written here why I think Bitcoin is important for the fin-tech industry – in a nutshell it’s not about the Bitcoin currency (which may or may not become one of the trading currencies on par with the RMB or the USD) but about the bitcoin (lowercase) inspired technology: the bitcoin blockchain and its massively distributed architecture. I believe this architecture will influence how the financial transactions are performed in the future. I used the opportunity of this post to add Ripple to the cartoon – I’ve also written about how this company uses the bitcoin blockchain architecture to perform very low cost international money transfers. Gigi has the last word on bitcoin – financial technology, all electrons that it is, needs to contribute, as all other industries, to the massive ecological problem we are facing as a civilisation. Danièle, Sam, and all the numerous others who have retweeted and favorited my tweets – many thanks for your kind words! And I give the final word – pardon, picture – to Jorge. And Jorge please comment below and tell us more on your thinking! The subject of open source software came about in several recent discussions and I thought the key points would be relevant for this blog. Here’s a summary in the form of a Q&A. 1. Open source software has been identified as a tool that can be used for highly commoditised IT tasks, including compliance, measuring performance, etc. Is this generally where financial services organisations use open source or is it transferring into other areas too? Open source has been used primarily in IT shops and especially on Unix platforms, where a number of necessary components are by tradition open source (things like file systems or graphical user interfaces). Over time, cost pressure has led the IT organizations to consider open source for mission critical components such as database management systems (mySQL) or the operating system itself (Linux). “The idea of OpenGamma came from a need I noticed while working in the risk and front office technology for financial services firms. My job was building generic infrastructures, but infrastructure for which there wasn’t a viable commercial offering. With financial services firms looking for cost reductions in every part of their operations, it seemed absurd that most of their IT budget was spent on building and maintaining expensive in-house systems that didn’t hold any proprietary value to the company. Trading and risk analytics systems are plumbing; as long as it works you shouldn’t notice it. So why should every firm build their own from scratch? Why shouldn’t there be an open source solution out there available to all? See more about OpenGamma here. See more about Allevo here. 2. Are there any serious security issues in mixing open source and proprietary software? One of the main advantages of open source software is that any security issue is transparently known and can be collectively & rapidly solved by the community developers, making the application at least as secure as the proprietary one. Thus the mix of the two cannot hurt more than mixing any types of software. 3. Is there not an argument that open source security problems are easier to pick up – and solve– than ‘commercial’ software? 4. How do you see open source take-up developing in 2013? Are there any clear trends that could emerge? Financial institutions are starting to take open source software more seriously. Allevo, OpenGamma are examples of firms pioneering the way in 2013 for financial services. I also think this is not only a financial industry trend; governments have started for a few years now to create policies designed specifically to encourage the use & adoption of open source software. I love writing about startups, and as we are reaching the finals of theInnotribe Startup Challenge at Sibos in Osaka, I dedicate an entry on this blog to each of the winners of the regional challenges. Each one has a story to tell. As story of overcoming business difficulties, funding issues, dealing with personal hardship. A story of how passion, patience and perseverance have won over many obstacles. So, here’s the story of OpenGamma, a startup focusing on financial risk analytics and which believes, as I profoundly do, that the open source approach to software is the most progressive and efficient approach in our hyper-connected world. I already wrote about open sourcing in the financial domain as a bold innovative move (see the story of Allevo). It is also the story of three entrepreneurs who have spotted an opportunity while working in financial institutions, and decided to do something about it. OpenGamma was one of the winners of the Belfast regional showcase of the Innotribe Startup Challenge. We will thus see them, along with 14 other startups, in the upcoming finals at Innotribe@Sibos in Osaka (29 Oct- 1 Nov, 2012), which promises to be amazing (register here to participate to Innotribe@Sibos). I’ve met Kirk Wylie, CEO of OpenGamma, and asked him to contribute his story and the story of OpenGamma for this blog. Giving the floor to Kirk. The idea of OpenGamma came from a need I noticed while working in the risk and front office technology for financial services firms. This thought triggedred an email to the other two co-founders, and the idea for OpenGamma was born. After the credit crunch, Jim Moores, Elaine McLeod and I set out to turn our vision of a single unified platform for analytics across financial services firms into reality. We were frustrated with the state of financial technology, and we wanted to change it. In building our flagship product, the OpenGamma Platform, we’ve taken all the lessons that the combined team has learned working in hedge funds and investment banks, as well as pure tech firms outside financial services. From the very beginning, we also dedicated a lot of time to grassroots market research. We met with people in technology, on the trading and risk desks, and in senior management, to talk about their experiences with analytics and risk technology. We wanted to build something that technologists would love to deploy, end users would love to use, and procurement departments would…well, accept. When we got to the point where we had people willing to go on record saying “If you build what you say you’ll build, and you have the business model you say you will, we’d buy it”, we realised it was time to start building. One of the most common questions we get is: “What do you mean by open source?” We use the term open source in its full sense: all code freely downloadable online, along with full documentation, user forums, bug tracking, and so on. There aren’t any catches here. To date, every component that we’re legally allowed to release under an Open Source license has been. However, although our approach is radical in the industry, our goal was never just to build open source technology. We wanted to build the best platform for financial analytics and risk management possible. We’ve released it under an open source license because that’s what the market told us they want. In the past, the industry has had three choices: buy a traditional, siloed trading system and spend years trying to get it to do what end users wanted; pay for an expensive, opaque external service; or build everything from scratch. With choices like that, it’s no wonder the preferred choice has been to build from scratch. Over and over. Within the same firm, across firms, developers keep building the same components because vendors haven’t given them what they need. These traditional choices don’t work anymore. Of course, open source software has often been championed as the low-cost option. While it’s by no means free, it allows firms to focus their IT effort on what’s specific to their trading strategies, which is perhaps only 10-15% of the overall technology stack. Allowing our clients to do this type of budget optimization has been one of our main goals in building OpenGamma. When everyone knows what’s going on under the hood, users can feel confident in trusting the results that they get out of the system—and not just take a vendor’s word for it. We knew what we wanted to build, but we also knew it was a massive undertaking. How would we actually finance it? While I’m generally in favor of bootstrapped business models for most startups these days, we knew that we were building something far too large to be done in that fashion. The sheer scope of what we needed to present as a minimum viable product meant that we needed external capital to get started. When I first moved to the UK in 2004, I’d met with Bruce Golden and Kevin Comolli of Accel Partners. In 2009, when we decided to launch, I knew they would be perfect partners in building OpenGamma. Accel believed in our vision, we raised a Series A round from them, and Bruce joined our board. We’ve since raised two additional rounds: Series B, led by FirstMark Capital in 2010, and Series C in August 2012, led by ICAP plc. Without investors who share our vision of radical disruption in the quantitative finance market, there’s no way we would have been able to build a system as comprehensive as the OpenGamma Platform. We are now moving our first customers from evaluation into full production installations. This is perhaps our most important milestone to date: some of the largest, most sophisticated capital markets participants are using our technology to manage some of the most complex derivatives portfolios in the world. Having these companies as clients is the strongest possible indication that our software works. As with any open source project, remaining independent, and truly open, is paramount to us. Customers greatly value the neutrality and transparency that open source players contribute to the industry. We need to continue being extra vigilant not to let them down. The part of my job I enjoy the most is meeting interesting people and companies from all over the world. One such company is Allevo in Romania. They have decided to open source their core business. A bold move, to shift the business model and competition from a pure commodity space to a more diversified services space. I’m following their progress in this endeavor – initially surprising, their analysis and reasoning is I think valid and innovative. Who is Allevo and what do they do? They are a software vendor and consultancy in financial transactions and payment processing, focusing on banks, micro-finance institutions and corporate treasury departments. An important part of their business is related to connecting the back-office payment related systems of their clients to SWIFT. As such, they are a SWIFT partner in Romania and some Eastern Europe countries. The reason I noticed them is because their 30-ish strong team has a strong innovation culture, and have been in touch at several occasions with Innotribe. They participate to and love the Innotribe events, to the point of adopting some of our tools and techniques themselves. And they also walk the innovation talk. Because innovation is needed in their market segments. Sorin Guiman, the general director of Allevo, explained it to me like this – ”Allevo has recently become aware of a perception paradox: perceived on the local market of being expensive, the company discovered that potential customers outside Romania hesitated to invest because the solutions sold by Allevo were in fact considered too cheap. Different markets and practices led to different perceptions of value: the same product was labelled both expensive and cheap”. Indeed, Eastern Europe is a mosaic of countries, some part of the European Union and using the Euro, some part of the Union with their own currency, and some not part of the union. All with very different standards of living and thus perceived values, in everyday life and in business. Sorin elaborated further – “At the same time, we noticed that the technological shift makes hardware & software products more and more affordable, therefore accessible to larger and larger consumer communities. Automation of business flows, processing of financial transactions and everything related is no longer something considered premium or disruptive or innovative, this has already become a commodity”. Very true as well. So far, nothing really new. What is interesting is the next step in their reasoning. When faced with the same pressure, many companies adopt the “milk the cash cow” strategy: make the existing product “stickier”, so that existing clients remain as long as possible with the product. The product evolves to a very bespoke, proprietary format and customers, the price actually increases over time and customers are more and more captive. But the market doesn’t grow. Another possible strategy is product diversification – for example, evolve the product to a cloud-based service, for a different market segment and using different business and pricing model. This is not always possible though, especially in the case of very monolithic products. Allevo have diversified some of their offerings. However, for their core product, called qPayIntegrator, Sorin decided on a totally opposite strategy: open-source. Make the source code available to anyone to use and adapt. Sorin explains: “Allevo needed to change its business model in a way that would allow further development of the company’s operations, that would attract new customers, that would create awareness and help build trust within the financial services industry. We have chosen to publicly share the value we’ve created. The product is free, thus the perception dilemma changes from ‘can I trust this vendor?’ and ‘it is expensive/ridiculously cheap’ to ‘does it solve my business need?’ “. The qPayIntegrator product becomes FinTP, the open source version. Of course, the first, probably surprised, reaction will be – “how do you make your revenues if your core product is now free?”. Sorin answers: from services around the product. Remember, Allevo has a consulting arm. What they hope to achieve is to expand the market that would benefit from these services, by making as many companies as possible adopt the now free product. My understanding is they want to be the equivalent of what Red Hat is for Linux, in the financial transactions processing space. Linux is a computer operating system, and is the best known example of open source development. Red Hat is a software company that distribute a version of Linux with associated services such as support, training and consulting. The product better be good, in fact so good that it gets adopted by a very large community, an order of magnitude larger than today. Linux got adopted widely because it was a pioneering operating system when it was first developed. They have to create a community of software developers around FinTP, to maintain and nurture the open source version. This requires a lot of activity, promotion and community leaders, such as Linus Torvalds in the case of the Linux community. Plus there’s the question of the sequence – in the case of Linux, the operating system and the community came first, and then distributions such as Red Hat came later. These are Allevo’s and Sorin’s big bets. Creating the open source community and at the same time capitalizing on it to provide consulting services will stretch the team. But they have lots of passion, and passion helps when facing challenges. A long journey starts with small steps – their first step was to find a name for the open source community – FINkers United. The second step is the launch event – on May 24th 2012 in Bucharest. Allevo have kindly invited me as a speaker to the launch event, and I’ll be there. I’m very interested by this experiment, and will remain a close observer and will help when I can. SWIFT has several software products in markets with similar characteristics as those outlined by Sorin, and perhaps we can learn from Allevo.